Day 3 Winner Announcement: First, let me announce our winner (via Random.org) of this giveaway series from Day 3. Congratulations to DontheApron! She will receive the Misa High Society Winter Collection. Thank you so much for sharing a little bit of yourselves with your answers to the Question of the Day. Our Day 3 Question was Lets talk Holiday food! Tell me what food(s) you look forward to eating during all of the Holiday festivities! Our winner answered Ooh - christmas cookies. I saw a recipe for one with cranberries and white chocolate chips that looked divine! 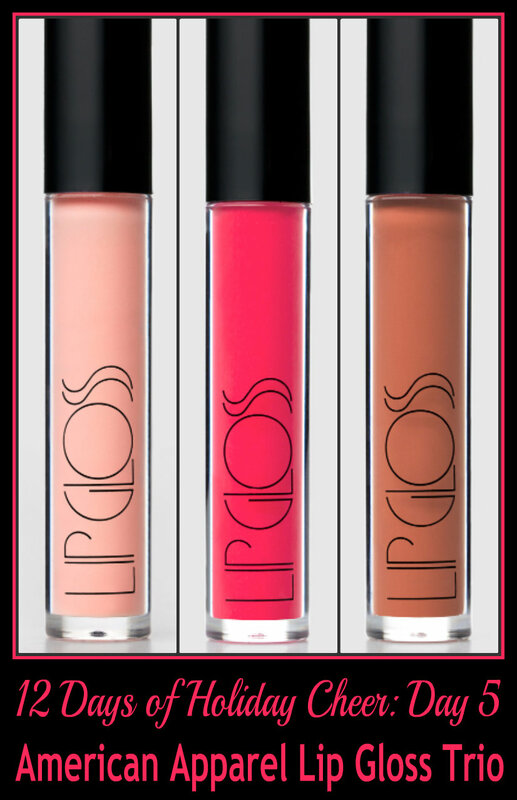 Day 5 of our 12 Days of Holiday Cheer Giveaway features three lip glosses from American Apparel. 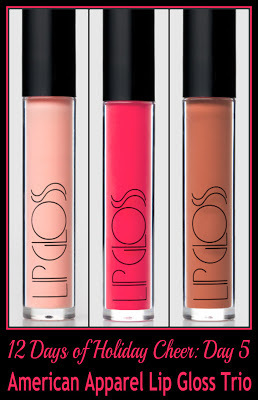 The shades (shown below l-r) are En Pointe, Micromesh, and Cafe Creme. Here's a reminder of the rules: Just answer the day's question (below) and leave your eMail in the comments (or check back to see if you've won if you don't feel comfortable leaving your address. You can then eMail me at mej0620@hotmail.com). U.S. residents only, Followers only (includes Google Friend Connect, subscribers, social media followers). 12 Days of Holiday Cheer Question Day 5: Let's go back to our childhoods...what is the first Christmas/Holiday gift you remember receiving? The first gift I remember getting for Christmas was a beautiful purple velvet dress! I was five :). I remember I was so enamored with it and wanted to keep it safe and pretty, so I put it back in the box. Well, mom came through to toss the garbage away, including my box! We didn't realize until it was too late that it had been taken to the dump :(. Oh dear, guess I'm still sad about it!! It was like.. a bubble of balls on wheels with a push stick? The balls popped when you pushed it, but I don't know what it is called lol. This question is harder that I expected. I remember one of my most anticipated gifts- an Easy Bake oven. I was so excited when I got and proceeded to rarely use it. But hey, it was a status symbol with little girls my age! I don't even remember how old I was, but I received a beautiful bride doll. Our cat had a wonderful time chewing its wedding dress! The first Christmas gift I remember getting was a plastic frog toy with butterfly wings, probably a character from some cartoon I can't remember. What I think makes me remember the toy so well is because it got lost/buried in the gift-unwrapping process, so I got to open one last gift after I thought we were all done opening presents for that year. The first Christmas gift I remember getting was a baby doll with a tiny plastic bottle. I held her, fed her, made a shoebox crib for her. I loved that baby doll. I remember getting a bride doll. I wanted one so badly, I must have been about 6 years old. I didn't really play with her, I just mostly stared at her.